Garage door openers do more than just pull the door up and down. The opener itself provides additional security against people pulling the door up and down manually from the outside. It has a sensor setup on it that offers protection against children and animals getting caught underneath the door. Many have built-in lights that help with getting in and out during the night. 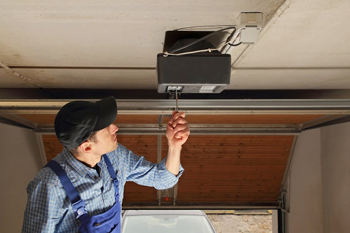 Here at Tustin Overhead Doors Repair, we offer full installation, sales, and service on all different brands of garage door openers including Craftsman, Genie, Liftmaster, Sears and others. In fact, we specialize on openers and, hence, we can provide you with the proper information and the consultation on choosing the right type of drive motor opener. The easiest solution is to get the chain drive. The pros are that it is very noisy and, therefore, ideal for those who want to hear if the door is intruded and they are, also, really cheap. Yet, if you don’t want the noise, you’d better pick the screw drive motor, which is quieter, but a little bit more expensive. Now, if you want a silent opener drive motor and you don’t mind its costly price, you should choose the belt drive because it is the greatest. Many people make the huge mistake of purchasing garage doors and garage door parts of the highest quality and leaving unprofessional people take care of the installation or replacement. However, if you want to be absolutely certain that your investment will resist the sands of time, you should also make sure to hire professional, qualified contractors to help you with the installation too. Our company provides exactly that! Rigorous, reliable and trustworthy, our team of pros is at your disposal and all you have to do is call them today! We provide affordable rates for both commercial and residential customers. We provide same day service for most situations. We can help you 24/7 with emergencies. Our trucks have a full stock of common repair parts to facilitate quick repairs. Our technicians have full training in most brands and configurations. We take pride in giving the best customer service. Call us here at Tustin Overhead Doors Repair. We can help you solve your garage door problems and get on with the rest of your day. Contact us when you need help.